UCOG Today [Paul Kieffer] » Blog Archive » See ya later alligator! Or maybe not, since this one won’t be doing much anymore. The city of Mobile owns a piece of undeveloped property about two hundred yards from our house. The property borders on Moore creek, and city trucks bring in dirt and take it back out again in some kind of ongoing job preservation activity, or so it seems at times. (Actually they are bringing sludge dredged from Mobile’s creeks and canals and then removing it later.) Their activity has created two large pits where the water is about 8 feet down from the top. 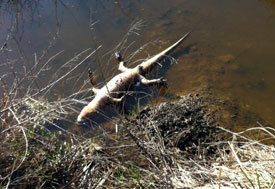 Lo and behold, a 4 foot dead alligator was floating in one of the pits the last couple of days. It may have been there longer, which is perhaps one reason why the work crews did not seem to spend a lot of time on the property last week. We sometimes see an alligator in the small creek behind our house, but this one is about 20 feet from the larger Moore creek, so he must have crawled in there and given up the ghost.